Before gingerbread season officially ends (at 12:01 a..m. January 29th), I thought I'd whip up a couple of cakes. Now, I do love a good gingerbread but it's not holy grail for me that it was for the late great Laurie Colwin (Gourmet columnist, novelist and home cook extraordinaire) who spent years in seach of the perfect gingerbread. 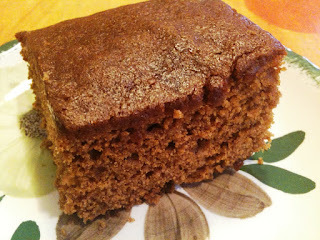 (She seemed to have found it in Home Cooking, but the sequel More Home Cooking has even more gingerbread recipes!) I like it because it's the quintessential home-baked good. It's pretty unusual to find it in bakeries (with the exception of Lady Bird Bakery in Park Slope which, when it opened a dozen years ago, sold a signature gingerbread), and even the name evokes an earier, simpler era. 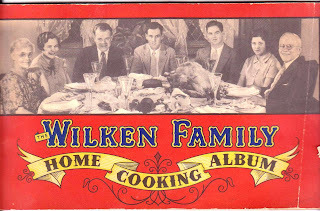 So I began this weekend with "Rochester Gingerbread" from the Wilkens Family Home Cooking Album, a collection of recipes from a family that once produced a Wilkins whiskey that advertised "Always $1.00 or under [for a] Full Pint." 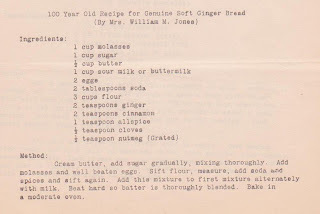 The recipe is pretty straightforward and easy (though I cook from old recipes, I use modern equipment like mixers). It baked up beautifully, with a fine texture and mild (maybe too mild?) flavor. 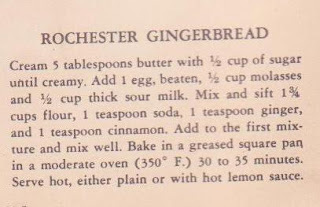 While that was still in the oven, I began a gingerbread recipe from Mrs. Osborn's 1919 recipe collection that the contributor boasted was 100 years old (putting it at 1819, before my "era of baking" but since it was still being used in 1919, I considered it fair game). Into the oven it went, and before long my usually lethargic son ran down to the kitchen, yelling: "Something's burning; I smell it all the way in my room!" Turns out I had miscalculated the size of the pan needed (these types of details are often left out of early recipes) and the excess batter was spilling onto the oven floor where it quickly turned to something more like charcoal than cake. Still, I was sure that once the extra batter expelled itself, what remained would rise and form a lovely cake. Maybe that would have happened, but the black smoke that quickly filling the house and the 26 degree weather (which prohibited leaving the kitchen door open) prompted me to remove the entire mess from the oven. This morning, after cleaning the oven (by hand because the self-cleaning oven feature would endanger the lives of my dear husband's birds) I remade the cake, halving the ingredients to fit in my 9" round pan. 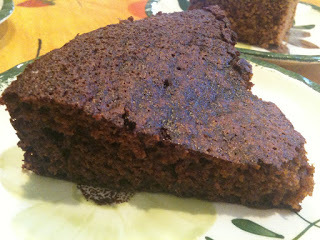 It turned out quite well, very flavorful with a "damp" texture -- trust me, this is a good thing in gingerbread. Meantime, 24 hours after the first batch my house still smells like gingerbread, slightly overdone. 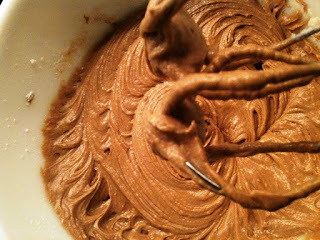 Which leads me to baking blunders, a topic with which I have great familiarity. Look for a recounting of my personal "agony of defeat(s)" in my next posting. Complete with pictures! How about ginger cookies? I had a craving for these over Christmas, but my friend the expert baker said that the one time she had tried to make gingersnaps -- there's a German name for them -- she got something with the taste and texture of a roof shingle. thanks for providing entertaining reading during my insomnia attacks - unfortunately your writing makes me hungry, not sleepy! @Zane: I do make a mean (and tasty) gingersnap. They have lovely texture -- nothing resembling roof shingles, I can assure you. I use the recipe from Alice Water's children's cookbook, Fanny at Chez Panisse). Perhaps your friend made lebkuchen, the German ginger cookie? I believe those are rolled cookies (and cut with a cookie cutter), whereas the ones I make are refrigerator cookies, shaped into a log, then sliced and baked as needed. @Anonymous: Thank you! I appreciate the kind words, and wish you a good night sleep tonight. Maybe you can just dream about cakes.